Crouched on the concrete, Joey watched it flutter and land, flutter and land. With 100 kids splashing and yelling in full swimming pool pandemonium - he and a few sat watching that flirtatious butterfly swoop and stop on the edge of the deep end. With palms open he sat, carefully studying and waiting. With a satisfactory smile, he slowly opened his hands to reveal his prize - but didn't even lift his head to notice it fly away. He stared in amazement. It was a brief keepsake, watching Joey in the midst of chaos. There is magic in mayhem. Magic: my new favorite word. But didn't that kill the butterfly? I am crying over here. Yours are always the first posts I read. So glad you've posted twice in the past week, I've missed you. Amazing. 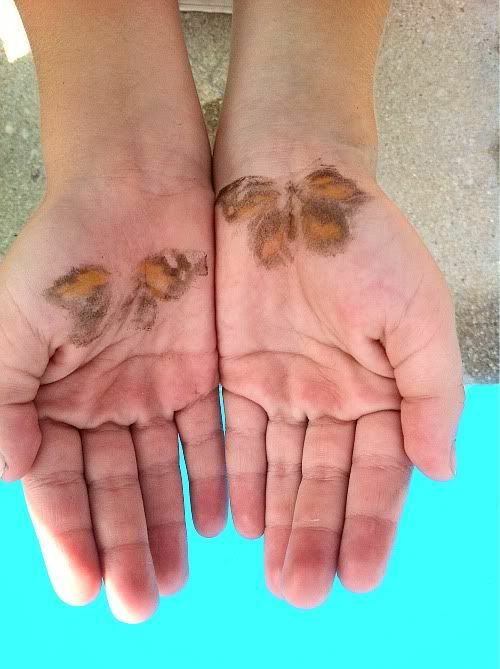 I can remember exactly how that wing-powder feels from countless childhood poolside catches. But I've never even imagined that it could create such a perfect stamp. Sweet parallel. I thought he smashed it for sure, Alice. But it flew away, alive and well. lucky butterfly. Joey still thinks it just turned to dust. I'll let him keep believing it. This gave me goosebumps. 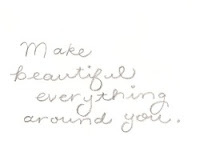 There is magic in the everyday...we just have to keep our spiritual eyes open. What a lovely photo. And memory. Delightful. awesome story! It's nice to be reminded that the world still holds magic for those who are looking for it. Thanks for sharing! Love it! Thanks for sharing this. Wow! It's perfectly imprinted there! What a neat moment. I love that he was willing to sit with all the crazy going on around him. To a mama, THAT's magic! on a diff comp these days & had to refind all the blogs i used to check daily! glad i remembered yours! this story is amazing!! what a treasure of a picture! !